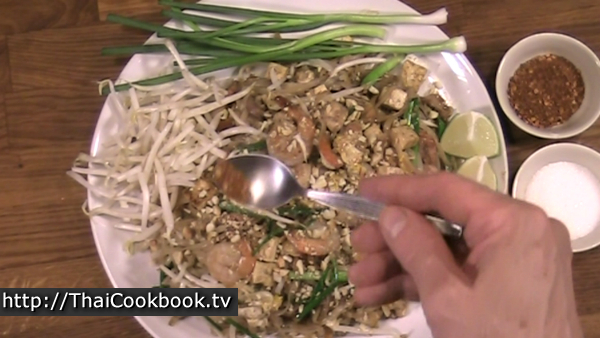 Pad Thai is one of Thailand's most popular and well known dishes. It's made by pan frying thin flat rice noodles with a unique sweet and sour sauce flavored with tamarind, lime, sugar, and other seasonings. 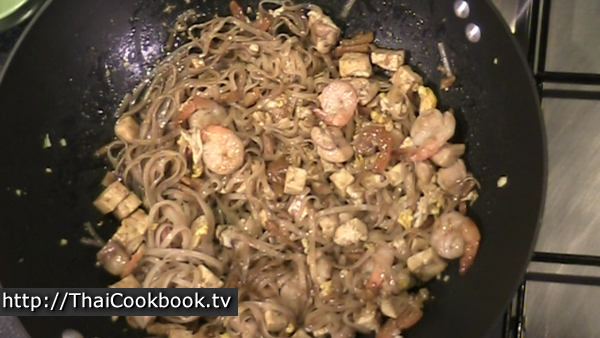 Authentic Pad Thai can have a wide-ranging combination of other ingredients, but often includes fresh and dried shrimp, chicken, pork, tofu, pickled radish, egg, bean sprouts, green onion, garlic chives and peanuts. 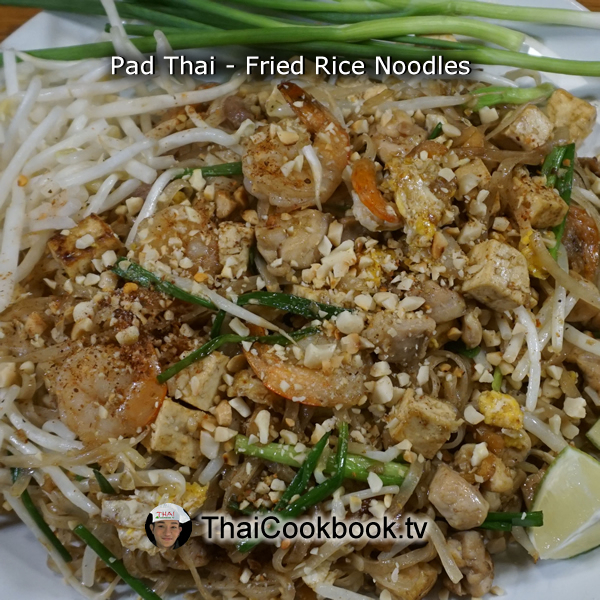 Pad Thai is usually made to order, so you can tell the cook how you like yours. It's quite easy to prepare, but getting all the ingredients together can take a little time. 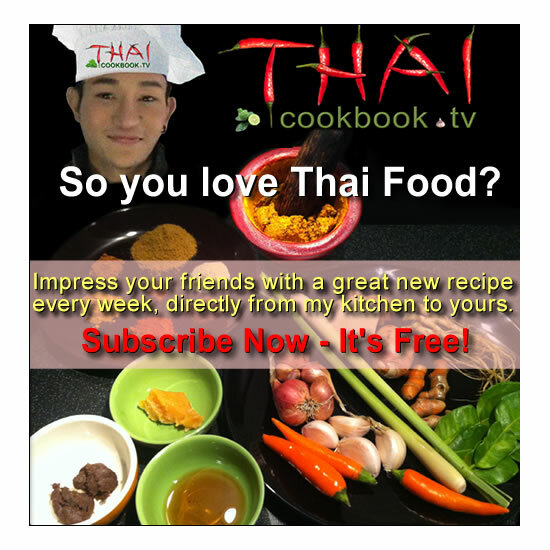 In Thailand most people don't bother making Pad Thai at home as it is so easy to find from local street vendors. If you live somewhere else, or just want to enjoy these delicious Thailand style noodles at home, this recipe and easy to follow directions can help. What's in our Pad Thai. How we make our Pad Thai. 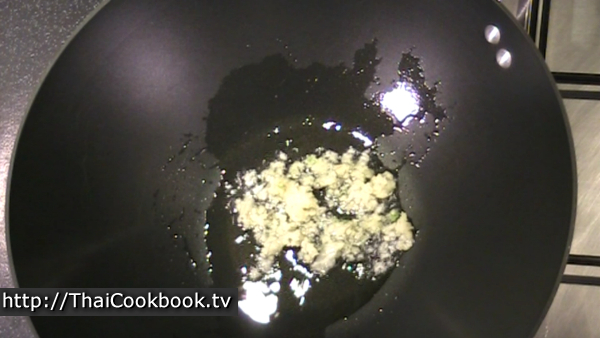 1) Fry the garlic lightly in a big wok. 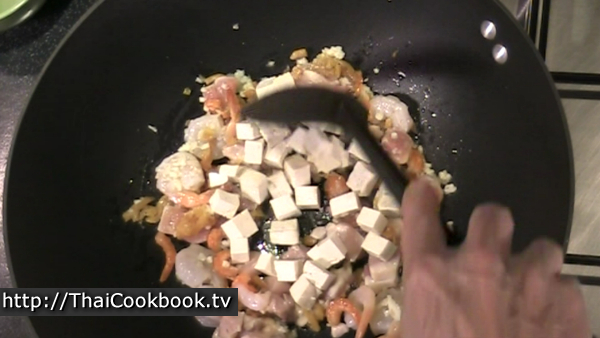 Add chicken, fresh shrimp, dried shrimp, tofu cubes, and sweet pickled radish. Fry until nearly done. 2) Make an open space on the side and fry a whole egg. Crack the yolk, then fry until nearly cooked without stirring. 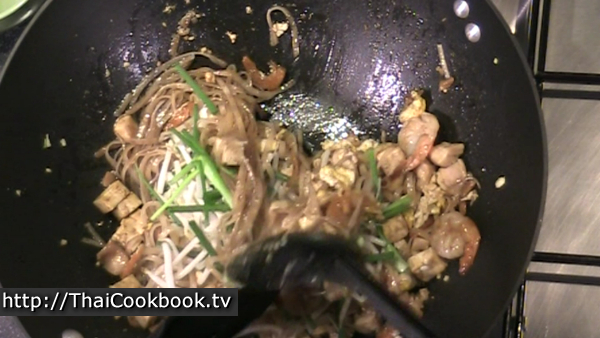 3) Add the prepared rice noodles and Pad Thai sauce. Stir fry, flipping from the bottom, until well blended and all liquid is absorbed. 4) Add the bean sprout and green onion on top, then fold the noodles over, making a pocket to steam the sprouts and onion inside the noodles. Turn of the heat, add chopped peanuts and serve with fresh bean sprout, green onion, lime wedges, crushed dried red chili, and sugar. If you are using dried rice noodles, prepare them according to the package directions. This usually means soaking in water at room temperature for about 15 minutes, then draining them well. When ready, the noodles will be flexible, but not soft. You should be able to fold one without breaking it. 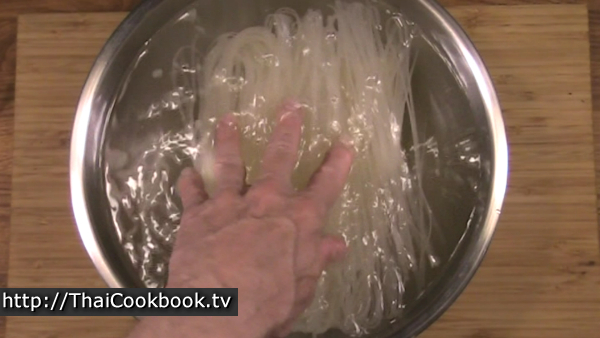 Noodles can be prepared in advance. 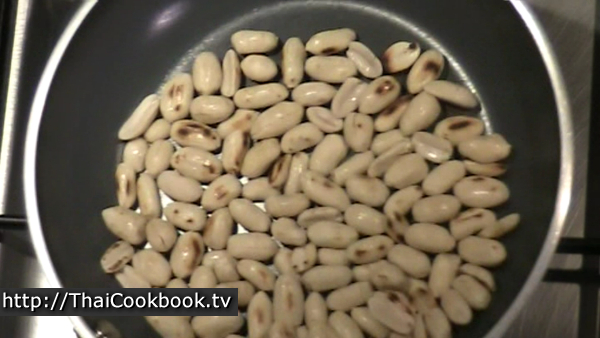 Drain them well and let them dry some, then put them in a plastic container or bag and refrigerate until ready to cook. They will stay good like that for at least 2 - 3 days. If making your own peanuts, toast raw, unsalted peanuts in a flat pan until fragrant and browned in spot here and there. Allow them to cool, then chop them well. I use a vegetable chopper, but this can be done with a mortar and pestle or just use a knife. 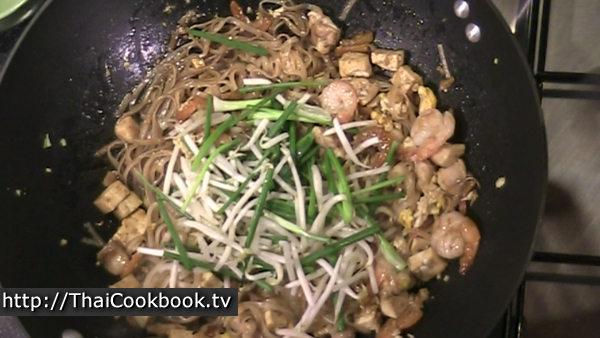 The ingredients used to season the Pad Thai can vary, and many cooks will just blend them on the griddle when cooking. However, making the sauce in advance will assure that you get the right combination of flavors without a lot of guessing. Pad Thai sauce is basically a sweet, sour, and salty sauce. If using palm sugar that comes in a big cube or disc, you'll need to chop it into very small pieces so it melts fast. Combine the sugar, tamarind paste, lime juice, vinegar, fish sauce, and Siracha style hot sauce in a small pan. 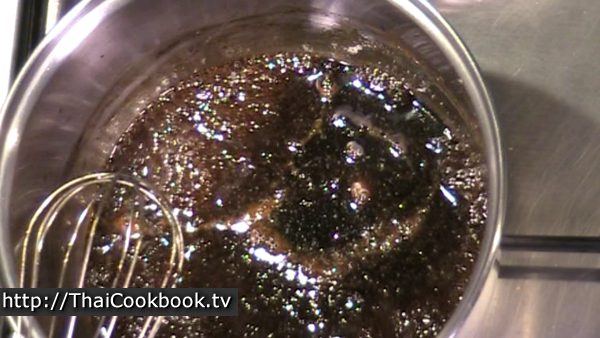 Cook over low heat, stirring continuously, until the sugar melts and everything blends into a thick and bubbly sauce. Remove from the heat and allow it to cool. Note: This is enough sauce for about 4 average servings, but you may want to use a little more according to your own tastes. Can be refrigerated for quite a while in a tight container if you want to make more for later. The precise combination of these ingredients can be varied, and if you want to make it easy on yourself, prepare everything here in advance and keep it in the refrigerator until you are ready to cook. This dish take about 5 minutes to make if all the prep work is done. Remove the bone, skin, and fat from the meat of one chicken thigh and cut it into small cubes. You can also use breast meat if you prefer it. You'll need about 1/2 cup. Peel the shells, remove the heads, and clean a few small shrimp. I used 8 small ones here. Cut the dark green top part of 3 - 4 green onions into 2 inch pieces. You can also use garlic chives and some recipes will use both. Save a few whole to serve as a garnish. Chop the garlic. Wash and drip dry the bean sprouts. 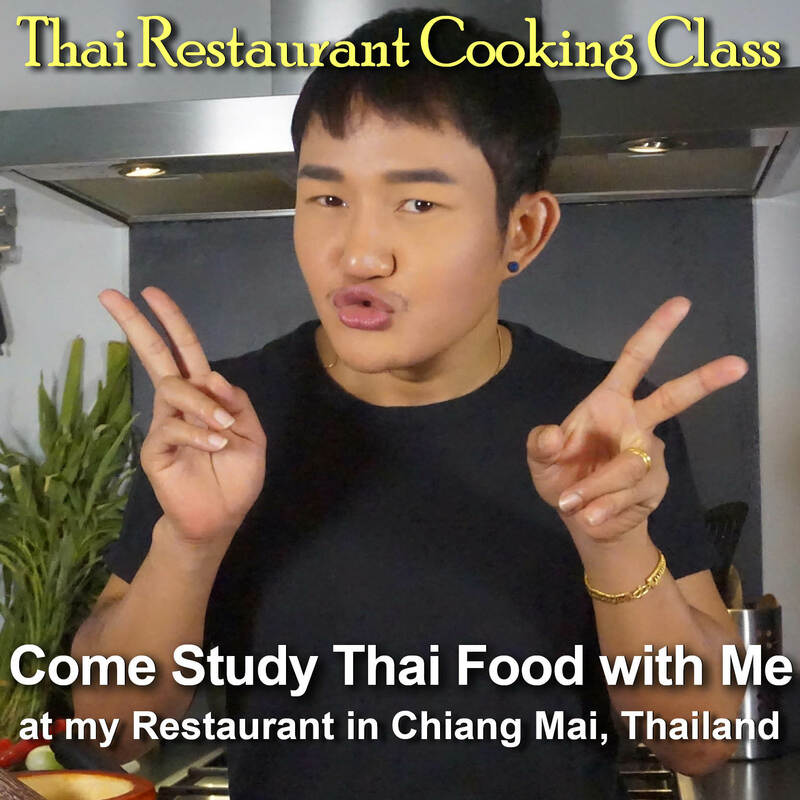 Along with the seasonings, pickled sweet radish and dried shrimp are the most important ingredients in making the Pad Thai taste the way it should. You might have to search online to buy them, but most Asian markets will have them. Rinse the prepared sweet pickled radish under plenty of water, let it drain, then chop the bigger pieces so it is all mostly small. 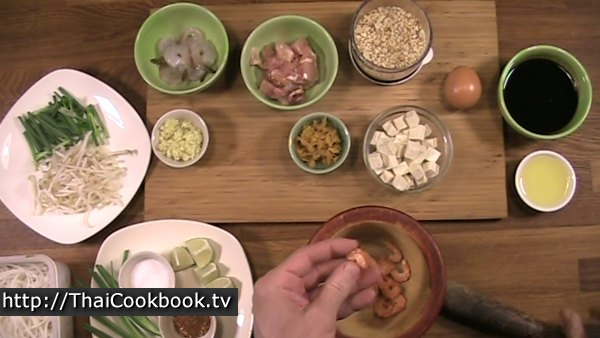 Use a mortar and pestle to pound the dried shrimp crack open in some places. They are quite hard, so I like to loosen them up to allow some sauce to soak in. You can also just use a mallet or heavy knife. 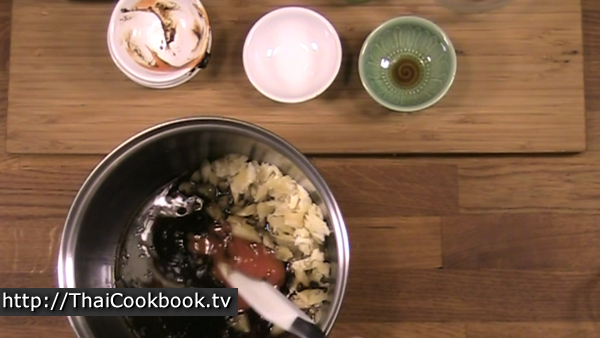 Just before time to serve, heat the oil in a large wok or frying pan over medium heat. Many of the ingredients will scorch if the pan is too hot, so keep it low. Cooking longer will produce better results. Start with the garlic, frying it lightly while stirring. 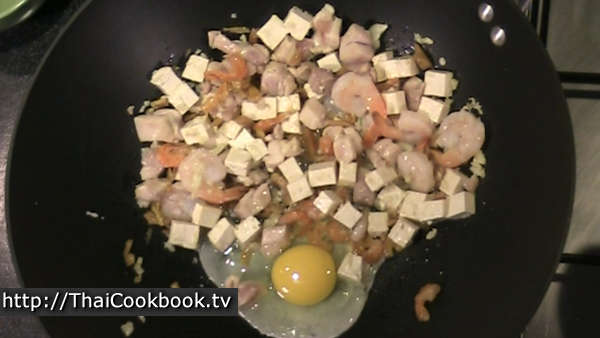 Add the chicken, shrimp, tofu, dried shrimp, and pickled radish. Stir and fry until the chicken is about half cooked. 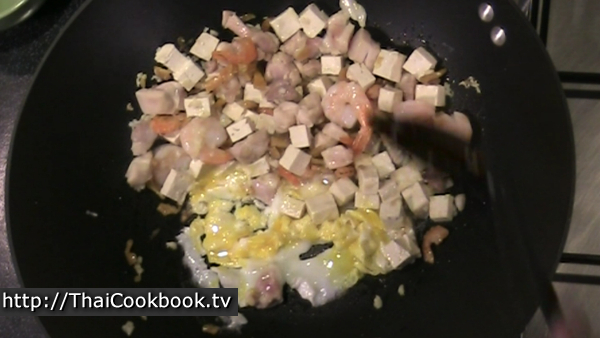 Move everything to one side of the pan, and put the egg in the open space. You want to have pieces of cooked egg as an ingredient, so do not stir the egg until it is nearly done. Break the yolk a little and spread it around and then wait until the egg is quite firm. Now stir it all up well and continue frying until the chicken is completely cooked. 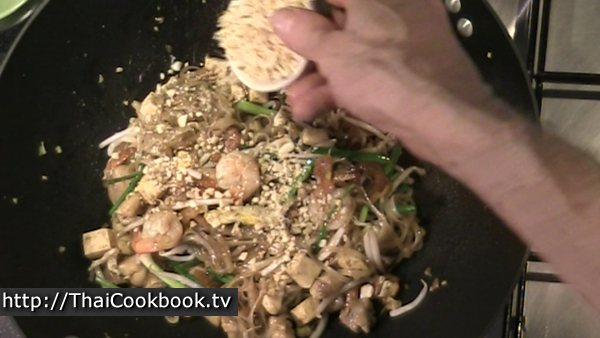 Add the prepared noodle to the top and push them into the ingredients and the oils so they start to soften up. When the noodles are softened enough to mix it all up well, add a about 3 - 4 tablespoons of the sauce. Stir it up and flip from the bottom over until it is all well blended. 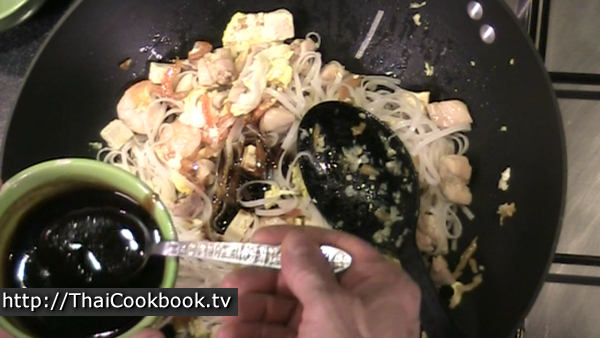 Cook and stir until all of the sauce and oils are well absorbed into the noodles, and it all looks brown and sizzling. 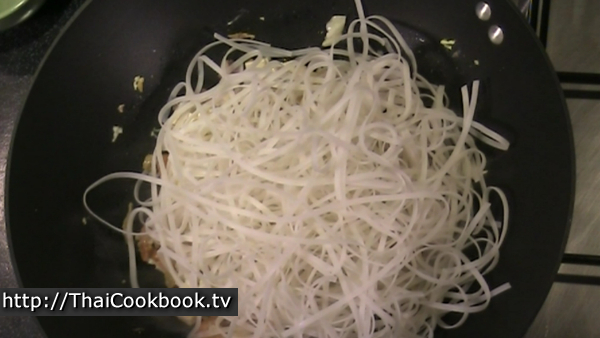 Carefully lay the bean sprouts and onion into the middle so it doesn't touch the pan. These will scorch easily and ruin the flavor. Carefully fold the noodles from the side, up and over so they make a pocket where the vegetables will steam cook inside the noodles without touching the pan. Avoid stirring it up right now for about 2 minutes. Just let it sizzle and steam that pocket of sprouts and green onion. Sprinkle about half of the chopped peanuts. Turn off the heat and stir the whole thing around a little so the peanuts get mixed in. This can be as many as 4 servings, depending on what other foods you'll serve. You can put it on small plates and then garnish each, but I like to put it on one plate to be shared. Serve with a mound of bean sprouts on one side, some green onion or chives, lime wedges, ground red hot chili, and sugar.